As a self-proclaimed lover of summer, even I get to the point where the heat wears me out. Hot summers are normal for us, but this year it seems like we are hitting all kinds of record highs, and for days on end. I can usually handle the heat for quite some time but then I hit my breaking point and just want it to be over! No, not over as in I wish it were winter, but over as in I wish it were in the 80’s. 🙂 On days like these, the last thing I feel like doing is cooking so that’s when I make a salad. 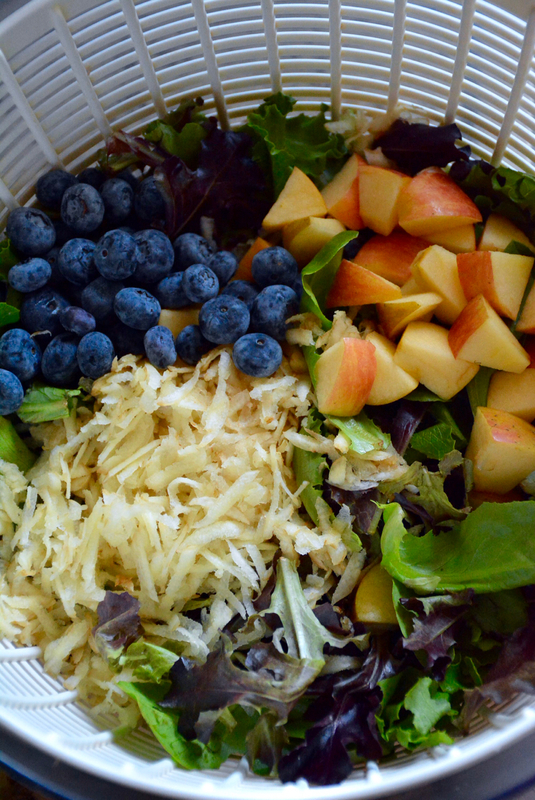 Fruit provides a nice sweetness, which in my opinion gives balance to a salad. During the summer when nectarines and peaches are at their peak, they are a great addition. Berries are also delicious as are apples (Fuji’s are my fav!) 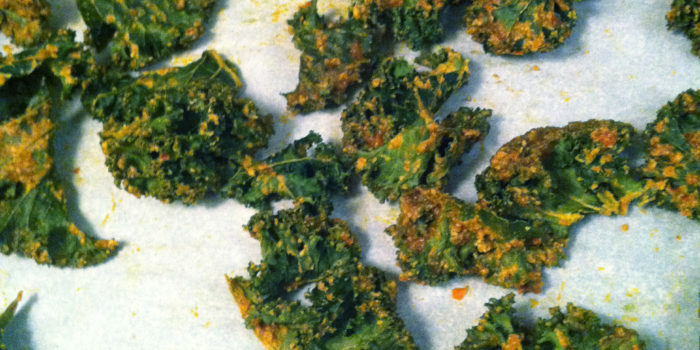 which also provide great texture and crunch. 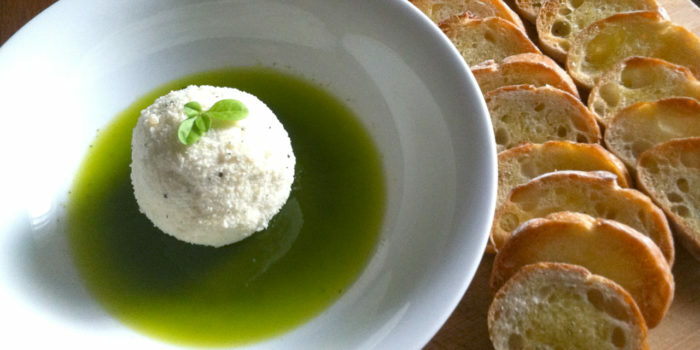 To add a slightly salty taste and creamy texture I use either goat or feta cheese. These play nicely with the sweet fruit and tangy dressing. You could also use a blue cheese if that suits your palate. For additional texture, crunch, and flavor, I like to add nuts or in this case, seeds. Pecans and walnuts are always a great choice. Regardless of the type of nut or seed I choose, I add flavor by toasting them first, then by coating them with sweet and spicy flavors. See my method below. As far as veggies go, I like baby lettuce and shredded carrots. Spinach would be great mixed in, as would arugula, if you like a peppery bite. For a salad like this one, I generally keep the veggies pretty simple. I make my own dressing using a 3 to 1 ratio of olive oil to vinegar. My preference for dressing is usually a balsamic vinaigrette, mostly because I always have the ingredients on hand…and I think it’s delicious! *Note: These measurements are for a salad that serves 2 large portions, but you can easily double the measurements if need be. dried herb blend – oregano, basil, rosemary, etc. For this part of the recipe I don’t use measurements. Just use enough of each ingredient to coat the chicken. Chicken: Preheat your toaster oven to 350 degrees (I use this instead of my regular oven so I don’t heat up the whole house.) 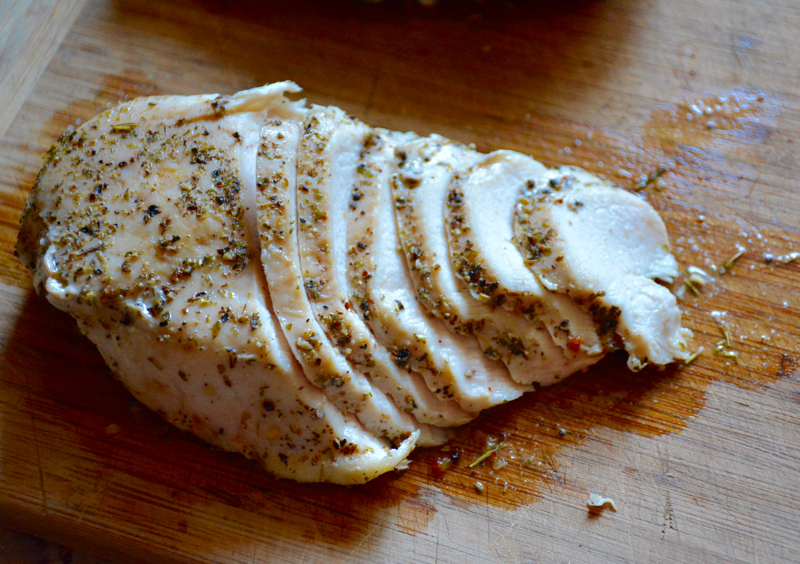 Lightly coat the chicken breast with oil and sprinkle with salt, pepper, and dried herbs. Place chicken in an oven safe dish and bake for 15-20 minutes. Check to make sure juices run clear. Cooking times will vary depending on the size of your chicken breast and your oven. Pepita’s: Heat a skillet over medium-high heat. Spray with a light coating of non-stick spray and place pepita’s in the pan. Toss to coat with oil. Stir the pepita’s often to keep them from burning. Once they are toasted, remove the pan from the heat and sprinkle on cinnamon, cayenne pepper, and salt, then toss to coat again. Now drizzle with maple syrup. 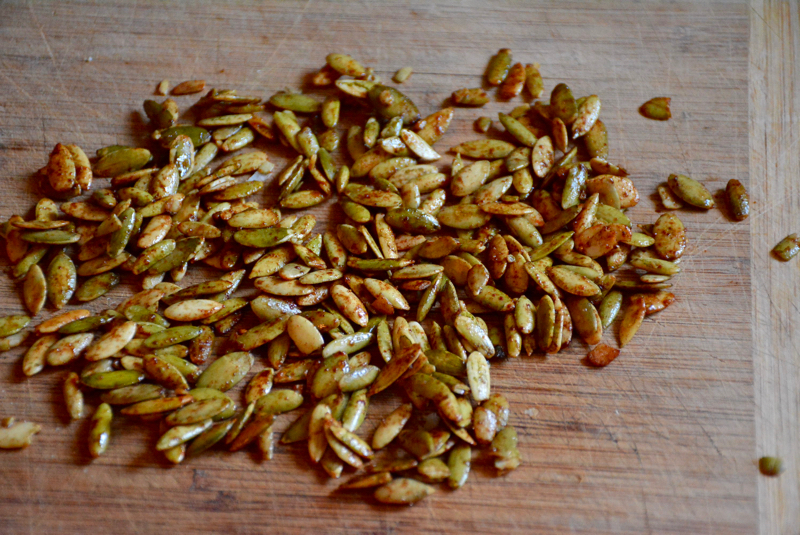 Stir so that each pepita gets coated and then place them on a cutting board or plate in a single layer to cool down. Dressing: Place balsamic vinegar (I use a thick, aged balsamic from Trader Joe’s) in a bowl and add the red wine vinegar, mustard, salt, pepper, garlic powder, and dried basil. Stir to combine. Now slowly drizzle the olive oil into the bowl while whisking to emulsify the dressing. You may find that your dressing is quite thick at this point so you can add a splash of water to thin it out a bit. Start with a small amount of water because a little goes a long way. Taste and adjust the seasonings accordingly. Once the chicken is cooked, allow it to rest and cool for about 10 minutes. During this time you can wash and prepare the lettuce, carrot, blueberries and apple. Then thinly slice the chicken on an angle, or cut it up in cubes, whichever you prefer. 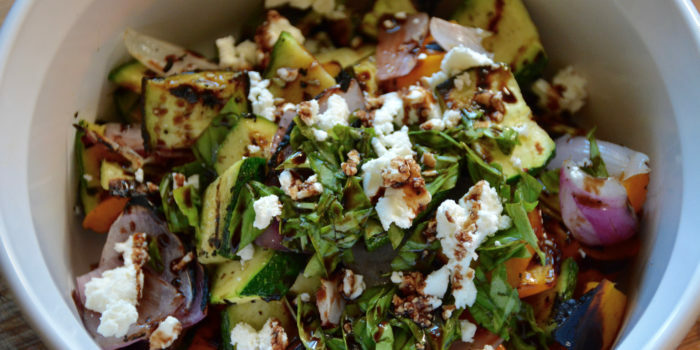 Assemble the salad in bowls and top it with the pepita’s and a sprinkling of crumbled feta. 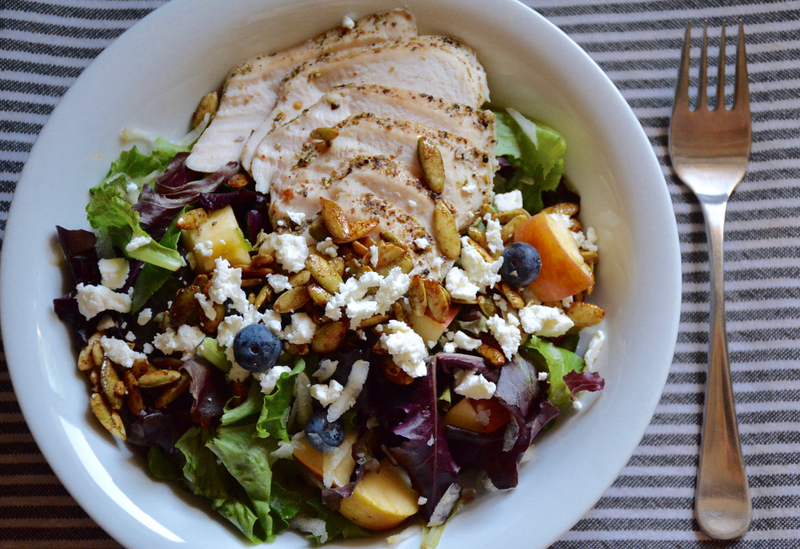 Drizzle with dressing and enjoy!